Yes, I have bought a lot of shoes in the last two weeks. I realised a few weeks ago that I have only been buying leather and suede shoes for most of the winter so I've had to quickly get ready for the warm weather. And in summer I pretty much only wear sneakers. 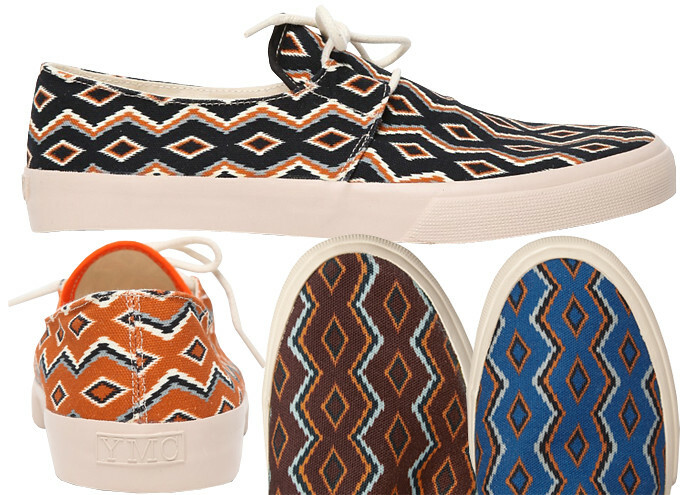 My latest purchase is a pair of the incredible navajo print model by YMC – from My-Wardrobe. I have only worn them twice so far but I have never got so many compliments on my shoes. Only yesterday a friend looked at them and shouted "I am in love with your shoes, where are they from?". I went for the dark navy background because, despite the fact that I love the orange, they look super chic with khaki trousers and they work great with evening looks. You can find the brown and blue ones over at Mr Porter and the orange ones at Oki-Ni.